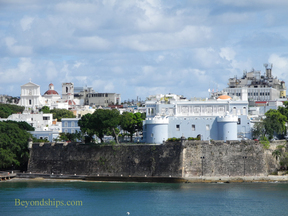 For most cruise passengers, Old San Juan is just at the end of the pier. Thus, it is a very convenient place to visit. 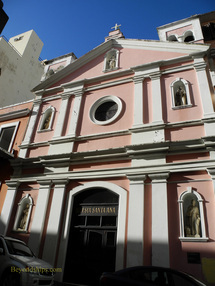 Old San Juan is the historic district of San Juan. For centuries, the city just existed within its towering stone walls. Consequently, much of historical significance can be found in this approximately seven square block area. For example, there are some 400 restored 16th and 17th century buildings here. Beyond the history, there is a charm to walking its cobblestone streets. 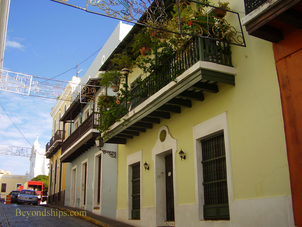 The colonial houses with balconies, the old churches and the wide plazas can be intoxicatingly romantic, particularly near sunset. There is a vibrancy as well. Old buildings have been put to new uses. The shops can be lively. 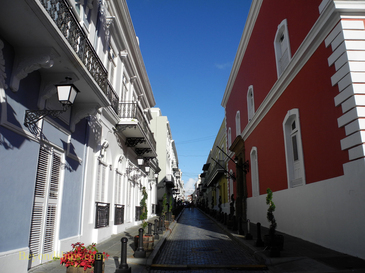 And the traffic on the main streets circling Old San Juan is city traffic. 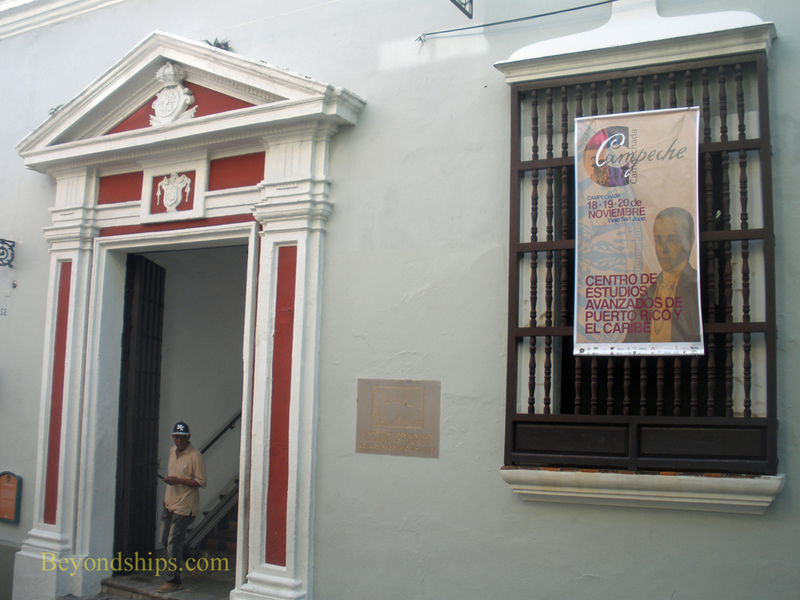 Below and in the pages that follow, we present some of the places of interest in Old San Juan. If you turn left upon exiting the cruise ship piers and walk westward, you come to a tree-shaded park. 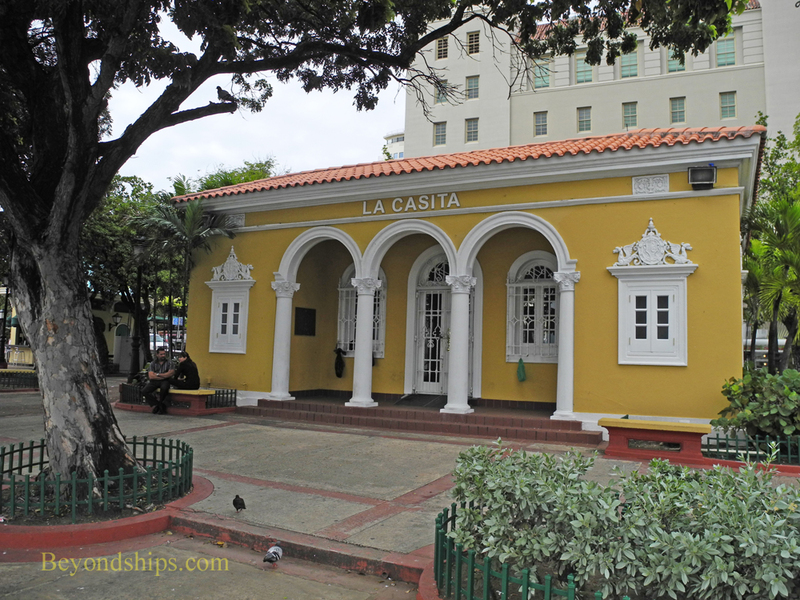 In the center of it is a small building known as La Cassita, which was built in 1937 and which has been used over the years by the Department of Agriculture and the Department of Tourism. 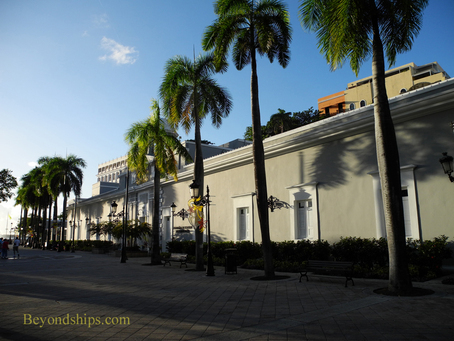 The area in front of La Cassita is the Plaza de Hostos. Plaza de la Darsena makes up the remainder. In this area, there are often local street vendors offering things to eat as well as arts and crafts. Projecting southward into San Juan Bay is a small peninsula. 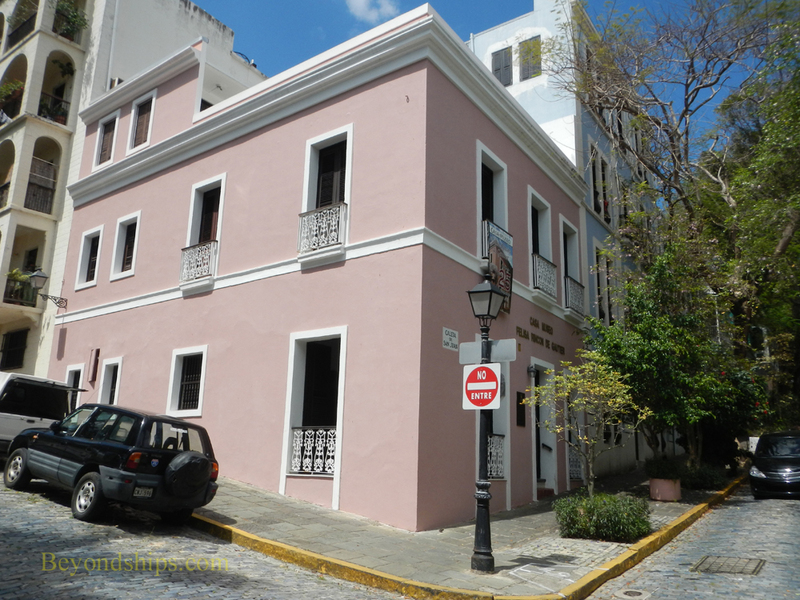 At one time, it was the home of the Spanish Navy in San Juan. Today, there is a U.S. Coast Guard base there as well as other government offices. However, there is also the Museo del Arsenal de al Marina Espanola (a.k.a the Shipyard and Arsenal Museum). 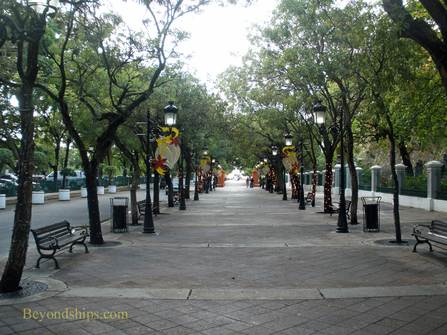 Going westward from Plaza de la Darsensa, you come to an elegant European style promenade called Paseo de La Princesa. (See separate article). 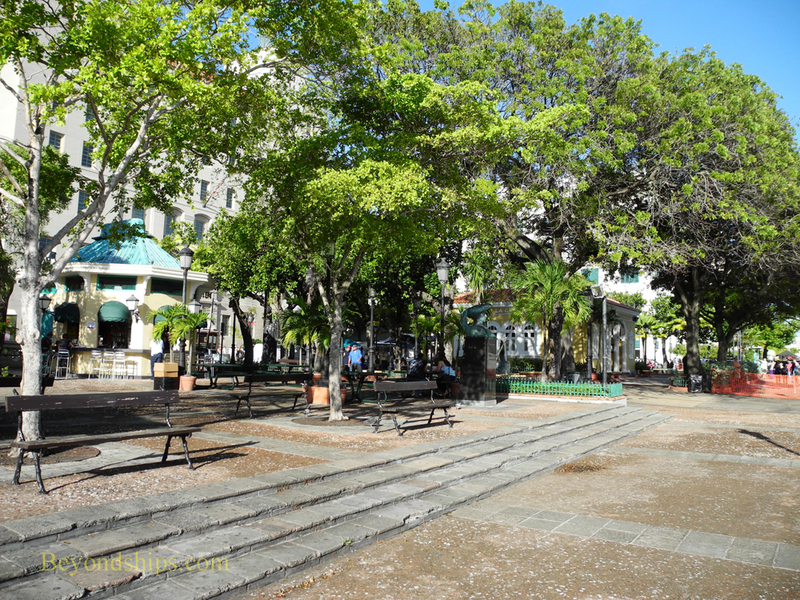 ​ Originally, created in 1853, the promenade goes past gardens, monuments and a restaurant. On the right side is La Princesa, which was once the provincial jail. It is now the home of the tourism company and has rotating art exhibits. 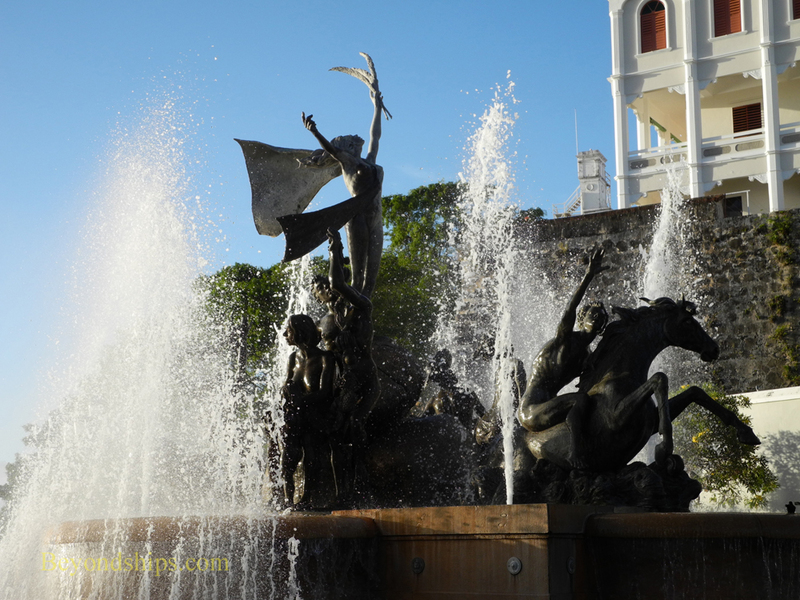 At the end of the Raices Fountain, which celebrates the ethnic roots of the people of Puerto Rico. The sculpture is by Luis Sanguino. 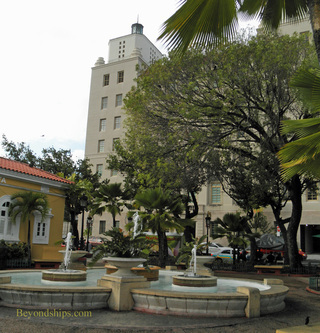 The Paseo de Princesa turns right at the Raices Fountain and goes along the sea. 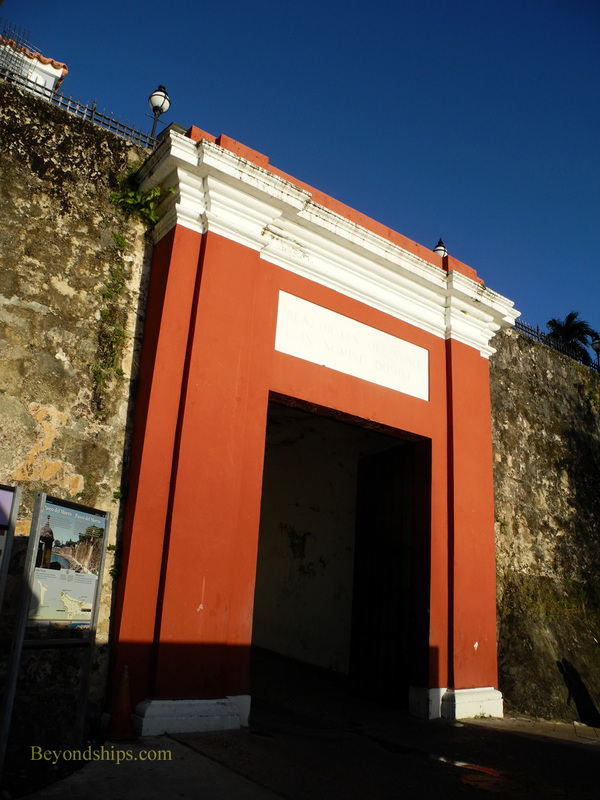 About a quarter mile further along this passage, you come to the San Juan Gate built in the late 1700s. At one time, there were six gates through the city walls, which are up to 20 feet thick and 40 feet tall. The gates were closed at sundown each night. This is the only one to survive. 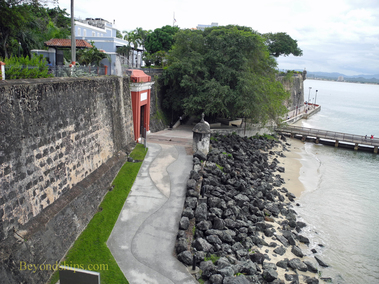 Just beyond the city gate you come to the Paseo de Morro, another seaside walkway, which winds along between the sea and the city walls up to the El Morro fortress. 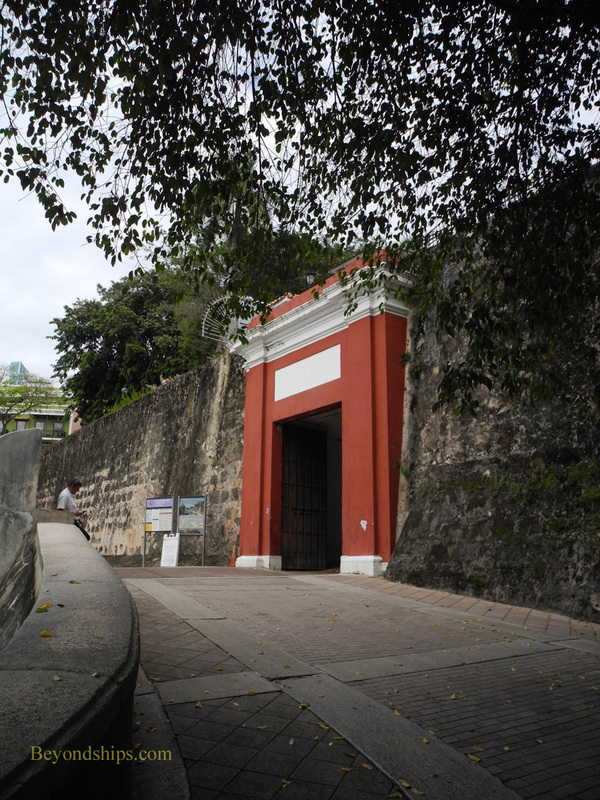 It is part of the San Juan National Historic Site and runs for three quarters of a mile. (See separate article). 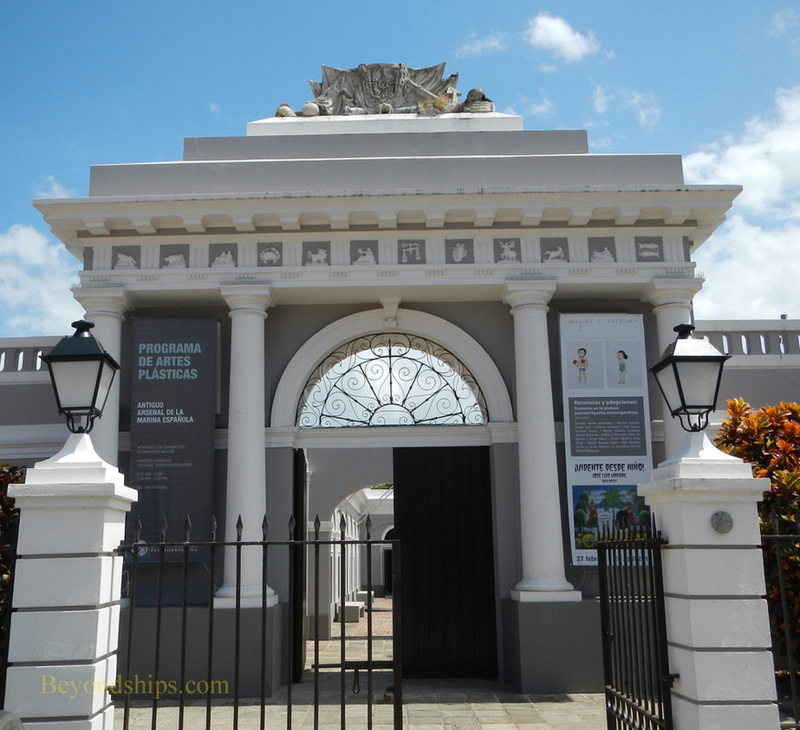 On the city side of the San Juan Gate is a small museum in the home of San Juan's first female mayor. It contains exhibits and artifacts from Dona Fela's career. 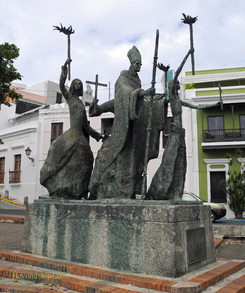 Atop the city wall north of the San Juan Gate is a small plaza with a statue commemorating a procession of the faithful during the British siege of 1797. The British commander, Sir Ralph Abercrombie, mistook this group for Spanish reinforcements and lifted the siege. In addition to the statue, from this vantage point, there are also good views of the harbor and the Paseo de Morro. If you continue north from La Plazuela de la Rogativa, you come to the Casa Rosa situated in a peaceful park land. It was built in the 19th century for the Spanish garrison. Now its is used by the architectural college. 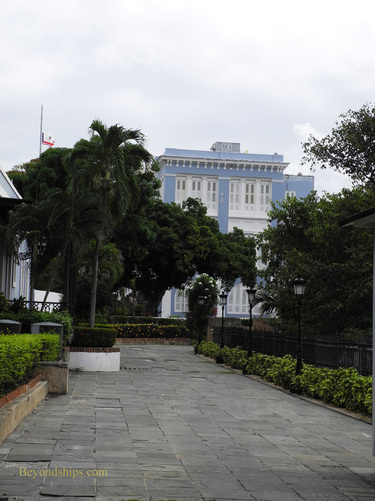 South of the San Juan Gate is the governor of Puerto Rico's residence. 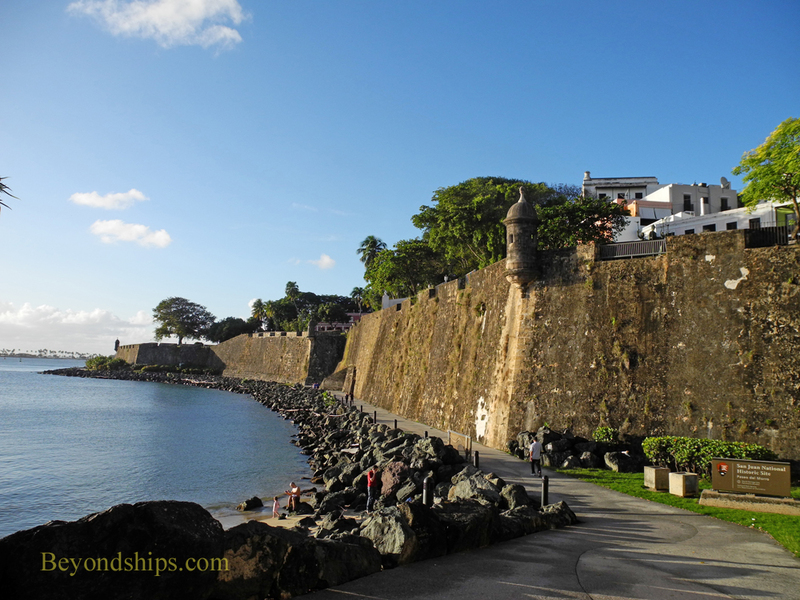 It was built in the 16th century as a fortress to defend San Juan Bay. In 1845, the main structure was given a neo-classical facade and it became the governor's residence. 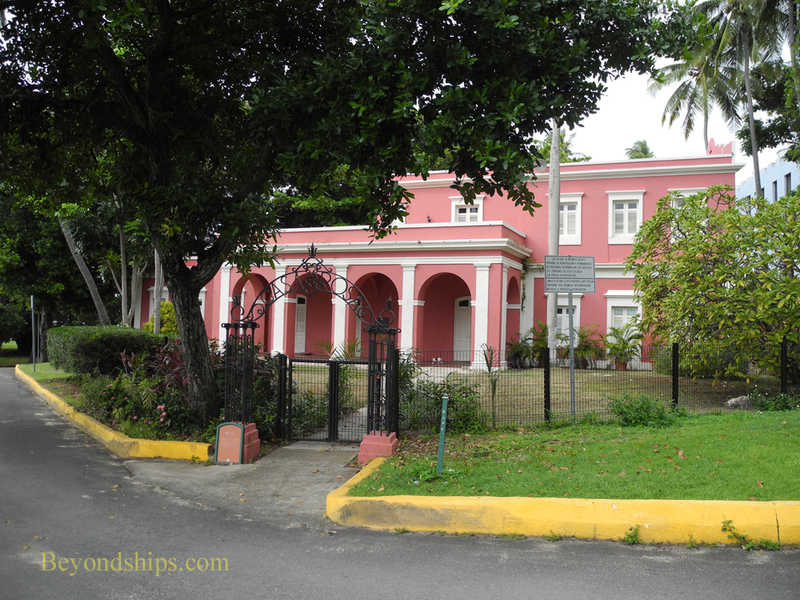 It is the oldest executive mansion still in use in the western hemisphere.